Dr. Rux can evaluate your case and tell you if you are a candidate for dental implants. 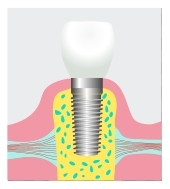 Structurally, a dental implant is a titanium-based cylinder that replaces the missing tooth root. After a period of time, other parts are placed on the implant to enable your dentist to eventually place a crown (cap) on the implant. 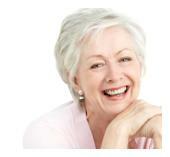 Implants can also be used to support full or partial dentures, dramatically improving denture retention and stability. Looking for a great implant dentist in Lakeway? For more information please call our office to schedule your consultation. These pictures show the healing cap that allows the gum tissues to heal around the implant. It is unscrewed and replaced with what is called the abument. implant and become the support for the crown to be placed later. The last two pictures show the completed restoration, a porcelain crown in this case. Now the patient who had previously been unable to chew comfortably is fully restored to the condition he was in prior to losing that tooth!